Members of WACC meet approximately every two weeks during term-time and these sessions are open to anyone interested, both internal and external to the university. For more information, please contact one of the co-convenors, Jo Angouri and Daniel Dauber. Our archive of events can be navigated to either by year (see above) or by theme (see below). Event themes: The Influence of Culture; Motivation and Intercultural Interaction; Culture and the Workplace; Adjusting to new work or study environments; Cultural Integration; Collecting Critical Incident data; Intercultural Issues in Research; Intercultural Relations in Education; Culture and Identity in the Workplace; Intercultural Interaction and Education; Researching Intercultural Experiences; Intercultural Adaptation; What is intercultural effectiveness? In the week of 24 June, we will hold our annual PG Conference. Thus, the entire day is devoted to our WACC Research Group and we hope you are able to attend several of our sessions. Hierarchy and Harmony in Japanese Business Discourse: How Can Japanese Managers Modify Their Communication Style for International Business? Our next WACC meeting is a planning meeting to look ahead into the next year and also take stock of what we have done so far. In light of recent projects that have either started already or are about to start, it is time to properly plan ahead to ensure that WACC's profile is best represented and reflecting within and outside Warwick. In this meeting, we will kick off our Term 3 PhD student presentation series again. This is a great opportunity for our PhD students to showcase their work in progress, receive additional feedback and advice as well as keep the entire group up-to-date about their ongoing research. Kyoung-Mi Kim will be the first one in this year's series. In this WACC meeting we will take a look at the following article about peer evaluation in team work. Ohland, M., Loughry, M., Woehr, D., Finelli, C., Bullard, L., Felder, R., ... & Schmucker, D. (2012) The Comprehensive Assessment of Team Member Effectiveness: Development of a Behaviorally Anchored Rating Scale for Self- and Peer Evaluation, Academy of Management Learning & Education, Vol. 11, No. 4, 609–630. Please take a particular look at Appendix B, which contains the assessment tool which we would like to discuss in light of other possible ways of peer assessments, in particular in light of the higher education context. 'Diachronic Critical Discourse Analysis: Analysing the representations of road users in The Highway Code over time'. The Highway Code is an iconic publication in the UK; it encodes the legal requirements for all road users in a set of numbered ‘Rules’ alongside advice about how to use the road safely. Anyone learning to drive or ride a motorbike must pass a test on its contents. Children are inducted into its expectations via road safety training at School and (often) at home. First published in 1931, it has gone through at least 12 editions and increased in size from something resembling a pamphlet (24 pages) to 93 pages in the current 2007 edition. This talk will present a diachronic analysis of selected features of these texts, using the synchronic analysis of the current edition as a baseline (Davies, in prep.). Through this kind of approach, we can trace how discourses of road use have changed over time and how this is indexed through textual modifications. In particular, it will focus on the way in which pedestrians and cyclists have been increasingly displaced from the road as cars have gained increasing hegemony over its use. Vehicles that are not cars and pedestrians are now difficult to see and require the more vulnerable road user to take responsibility for their own safety by changing what they wear and/or how they interact with the road. Because they are difficult to see, they have become special cases which are othered and somehow not expectable in the road environment. In addition, supposedly generic rules for all drivers and riders relating to the use of the road have increasingly shifted to constructions that imply or presuppose the implied reader is a car driver, thus further marginalizing other road users. Other than Fairclough (1993), who offers a brief diachronic analysis of University prospectus pages over a 20 year period, such a diachronic approach is rare. However, it can offer many insights as it demonstrates how discourses now perceived as common sense have been gradually sedimented over time in successive versions of the ‘same’ text. In this case, it highlights a conflict between stated government policy in relation to transport – the promotion of ‘active travel’ – and the dominant discourses in an official text designed to both train new drivers and regulate road use. Human Factors and Ergonomics Society, 50(3), 540-547. 12pm, A1.05: In our upcoming WACC meeting we will follow up with this year's theme 'intercultural team research'. This time we invite you to read and discuss the following article: Salas, E., Cooke, N. J., & Rosen, M. A. (2008). On teams, teamwork, and team performance: Discoveries and developments. Human Factors: The Journal of the Human Factors and Ergonomics Society, 50(3), 540-547.
our previous papers were. We hope you enjoy reading it and look forward to our joint discussion. If you would like to download the article you can do so by clicking here. Media act as filters of everyday reality (Silverstone, 1999) and structure our ways of thinking (Bennett and Edelman, 1985; Liu et al., 2011). By drawing ‘symbolic boundaries’ (Loseke, 2007:661), they affect the way we perceive ourselves and others and construct in that way identities (Schneeberger, 2009; Georgiou, 2006; Derman and Ross, 2003). The present paper draws on data collected in a 2014 project, which investigated issues of Turkish-Greek relations from an identity perspective, making use of the phenomenon of Turkish TV series transmission in Greece. Using as starting point attitudes of Greek people towards Turkish TV series shown by Greek channels, the aim was to shed light on the way participants constructed the image of Turks. The data collection process of the study included the distribution of 100 questionnaires and the conduction of 10 semi-structured interviews with permanent residents of the city of Thessaloniki, in Greece. The paper conceptualises identity under social constructionist terms, as socially constructed through discourse and as constantly negotiated between participants. Identity is also conceived as relational. That is, the constant confrontation of self with others involved in it are supposed to be ubiquitous in its construction (De Fina, 2010; Andreouli, 2010). Due to space restrictions, in the present paper I present only a part of the qualitative part of the study, which was analysed thematically. More specifically, I choose to focus on the way participants perceive ‘Europe’ and on the terms under which they negotiate their belonging to it. The current research area was not part of my initial research questions, but emerged so forcefully in my analysis that could not be left out. At the same time, the idea of Europe and European integration offer be default a prominent source of identification, so it was conceived as highly relevant to the construction of the identity profile of my participants. The findings demonstrate that Europe is associated to notions like education, democracy, Christianity, transparency and safety. At the same time, Europe is constructed in the minds of the participants as the positive pole in the binary opposition Europe-East. Their position though in terms of Europe-East lies somewhere in the middle. Contradictory perceptions on their ‘Europeanness’ co-exist, revealing the fluid and multi-level character of identity. Finally, insightful conclusions can be drawn also with regards to the transformative power of media on the audience’s perceptions of the Other. Why are intercultural issues relevant to business, and how to respond as external consultants? In this session Nigel Ewington – Director of TCO International and WorldWork Ltd - will look at some of the main issues that business faces in adapting to a global world, particularly focused on leadership and teamwork. He will present some of the client challenges he has been presented with as a consultant delivering training and coaching for the professional market. He will be ready to answer questions to those interested in acting as professional service providers in the area of intercultural management. In this WACC meeting we welcomed Miya Komori-Glatz who gave a guest talk about intercultural teamwork in a higher education context. At WU Vienna, Europe’s largest business university, almost half the master’s programmes are taught in English, attracting students from all over the world. Teamwork plays a large role in the course structure, and students often have to work in intercultural groups where English is usually the lingua franca. This presentation outlines my PhD project, which explores language and interaction in three groups from two master’s programmes (one focusing on sustainability in global supply chains, and the other on market entry in South-East Asia). The data set for each group includes audio and video recordings of their group meetings (around 20 hours per group), their group Facebook chats, the finished product (presentations and reports) and reflective interviews with each of the group members. I am currently working on the conceptual framework for analysing this data, which will be based on Dafouz and Smit’s (2014) discourse-centred EMEMUS (English-medium education in multilingual university settings) framework. The specific focus of the presentation will be conceptualising intercultural teamwork and its practices. This is based primarily on research from management and organisational psychology but also draws on recent studies with a focus on English as a workplace lingua franca. At the moment this synthesis is primarily structured along Salas et al.’s (2005) “Big Five of Teamwork” (team leadership, mutual performance modelling, backup behaviour, adaptability, and team orientation) and their three “supporting and co-ordinating mechanisms” (the development of shared mental models, the achievement of mutual trust, and engagement in closed-loop communication; p. 559). I would particularly appreciate feedback on this conceptualisation of teamwork and its practices and look forward to discussing to what extent student teamwork can be seen as preparation for an intercultural/global workplace. I would also enjoy hearing about the experiences students at Warwick have had and how that compares to what I have observed at WU. Abstract: Translation contexts are sites of encounter where mediated interaction is practiced, either in the sense of translation practice in professional contexts or in the sense of implicit transfer of meaning in the mind of a speaker who attempts to transfer meaning into a foreign language. The seminar highlights instances of English-Greek mediated interaction, drawing on institutional discourses, where genre, organizational hierarchies, politeness, gender and leadership shape construction of identities in discourse. The seminar intends to show that translation seems to be equally eloquent in revealing loci of difference in socio-cognitive aspects of experience. It is thus claimed to be able to make a considerable contribution to the study of inter- and intra-cultural communication , which would be of interest to professional communication analysts and language teachers. In our next WACC meeting we will continue our discussion around teamwork, but this time with a particular focus on the actual merits of working in a multicultural team and in which relation they stand to the challenges faced when working in a culturally diversified team. Stahl, G. K., Mäkelä, K., Zander, L., & Maznevski, M. L. (2010). A look at the bright side of multicultural team diversity. Scandinavian Journal of Management, 26(4), 439-447. In our upcoming WACC meeting, Daniel (Dauber) will present first insights from the SB and ISB (International Student Barometer) data that he and Helen (Spencer-Oatey) collected and prepared for analysis. A particular focus will be put on students' perception of multicultural group work. We look forward to a lively discussion about the presented results. In our next WACC meeting Jo and Daniel will provide an outline of WACC activities and also present a small project that they will lead on 'Decision-making in multicultural teams: A cross-disciplinary review of theories, methods and findings'. WACC members are invited to joint this undertaking which is aimed at producing a publishable paper at the end of term 3/during the summer. Particular emphasis will be put on synthesising findings and approaches to achieve a holistic perspective on multicultural team research and suggesting a future research agenda. For Wednesday we would like to invite everyone to read the following article, which we will use to start a critical discussion about multicultural teams and their success or failure/performance, also from a research design angle. Our first WACC meeting will be our planning meeting for CAL staff only. Not only do we aim to define the direction for WACC for the rest of the year, we also need to think about what to put into the 5 year plan, as well as reflect on our activities and their potential outcome and impact. We welcome Petr Matous who will give a workshop on Social Network Analysis. Since all of the places were taken so quickly, we had to put people on a waiting list, but it looks very unlikely that additional places will become available. For a more detailed breakdown of the schedule and room arrangements for this workshop, please visit our dedicated website. As you all may know, our next WACC meeting will take place tomorrow from 2-3pm. Our first gathering will be an internal meeting only to discuss the themes and plans for the upcoming term and in particular decide on what people want to contribute to WACC. We hope many of you can manage to come along and help shape the way we run WACC this term. In our next WACC meeting we warmly welcome one of our new visiting scholars Farzad Sharifian from Monash University (Australia). He is a linguist with a multidisciplinary background in cognitive science, anthropology and education. On Thursday 17 July, Farzad will give a talk about Cultural Linguistics: The Development of a Multidisciplinary Paradigm. This presentation provides an account of the development of Cultural Linguistics as a multidisciplinary area exploring the relationship between language, culture, and conceptualisation. Cultural Linguistics grew out of an interest in integrating cognitive linguistics with the three traditions within linguistic anthropology of Boasian linguistics, ethnosemantics, and the ethnography of speaking. For Cultural Linguistics, many features of human languages are entrenched in cultural conceptualisations, including cultural schemas, cultural categories and cultural metaphors. In recent years, Cultural Linguistics has drawn on several disciplines and sub-disciplines, such as complexity science and distributed cognition, to enrich its theoretical understanding of the notion of cultural cognition. Applications of Cultural Linguistics have enabled fruitful investigations of the cultural grounding of language in several applied domains such as World Englishes, intercultural communication, and political discourse analysis. This talk elaborates on these observations and provides close examples of linguistic research from the perspective of Cultural Linguistics. For more information about Farzad, please have a look at his university profile. We hope to see many of you there. The WACC meeting will be the keynote speech of Professor Martha Maznevski at our annual PG Conference. None of the WACC members is required to pay conference fees to participate in this event since it is part of our regular WACC meetings. However, make sure you come early to get yourself a seat. We have more than 75 participants this year (not including the 20 committee members). Martha M. mentioned she would appreciate getting to know more about the research in WACC. It is certainly a great opportunity to exchange thoughts with a reknowed scholar in the field. For more information about the 17th PG Conference, please have a look at the website. In tomorrow's WACC meeting our two PhD students Sherry and Thomas will present the status quo of their dissertations. We hope many of you can manage to come. Needless to say that feedback to our PhD students is crucial in helping them to improve their research or simply gaining more confidence in what they plan to do. It promises to be a very interactive meeting, with plenty of ideas and suggestions to take away for them. Abstract: Intercultural competencies (ICC) gain increasing importance as employability skill for graduates entering the global workplace (CIHE 2012). Measuring graduates’ cognitive preparedness for the global workplace could help facilitate this transition. However, current approaches to assessing ICC often lack reliability, validity, feasibility or empirical underpinning (Matsumoto & Hwang 2013). I will present a data-driven approach to conceptualising and assessing cognitive preparedness of graduates entering the global workplace. The research I present is still work-in-progress and focuses on the main stages of test development with a view to validating each step, hereby referring to data collected so far and preliminary analyses run. In a first step, needs analysis examined the issues newcomers face when entering workplaces in multicultural settings, and competencies they should be equipped with in order to deal with these issues. Thematic analysis of interview (n=51) and questionnaire (n=260) data lead to a conceptualisation of issues and challenges, which is currently validated by experts and novices in global workplaces. Furthermore, CIs were distilled from the needs-analysis data to examine the test construct. Five of these CIs were trialled in an open approach with a total of 14 participants. The videos are currently examined for cognitive processes and competencies needed to interpret the CIs, informing the competency model and the development of MC options reflecting different ICC ‘levels’. The paper ends with an outlook on the next steps, encompassing construct validation, test specification in order to characterise tasks and items, test development, IRT-/regression analysis-based construction of competency levels, and validation studies accompanying each of the steps. It is that time of the year again where we ask our PhD students to give us an update on how they progress and also offer them to ask us crucial questions about their research. Sherry (Xiaozhe Cai) and Thomas (Greenaway) will take over the floor for the upcoming WACC meeting. Abstract: While undertaking international education has become increasingly popular in our globalising world, cultural adaptation in a foreign institution with different cultural values and social norms, particularly with a language barrier to overcome, is a pivotal factor that affects students’ academic success and career development. This research is based on 12 past Chinese doctoral students in UK HE, drawing on qualitative data from semi-structured in-depth individual interviews and complementary quantitative data from closed-questions, as well as data such as English test scores, English learning history and their learning outcomes in UK HE. Employing Bourdieu’s cultural capital theory, the talk explores how this cohort experienced cultural adaptation and personal capital formation by examining their real study and life experiences during their stay in the UK¸ with a focus on the association between UK education and career development. It concludes that only after they acclimatise themselves to the British educational culture and surmount the English language barrier can Chinese students form their personal cultural capital and ultimately complete their international education, which will subsequently underpin their career development. In our next WACC meeting, Andy Davidson and Sophie Reissner-Roubicek will be talking about the Global TIES course developed by CAL in collaboration with the British Council, Japan. They will be talking about the genesis of the e-learning course, course content, their approach to its delivery, and how the course has been received by participants in Japan. They would also like to share with us their draft of the standalone (self-access) version of Global TIES Module 1: Understanding Culture for Work. Andy and Sophie hope to release this product soon and so our feedback on this e-learning course will be very much welcome. Lynette Richards and Dr. Sophie Reissner-Roubicek will be giving a presentation titled 'Intercultural training as action research: Case study of a student teamwork exercise in the Statistics department’. We very much look forward to their talk and hope you will join us for a fruitful discussion. 27 March from 2-3.30pm in S2.85. Please note that changed time. Future regular meetings will take place at 4pm. Jo will give a presentation on 'Negotiating language use in the modern workplace’. Dr Perry Hinton will be giving a talk on Stereotypes: Cognition or Culture? For ninety years stereotypes have been viewed as rigid overgeneralisations. This has led to the research question: why do people use them if they are inaccurate? This is particularly important as stereotypes have been linked to prejudice and discrimination. A range of explanations have emerged, such as personality (authoritarianism) or cognitive simplicity. The dominant view in psychology is that the nature of cognition requires categorization and simplification in social perception. This seems to imply that stereotyping is inevitable. To avoid this, social cognitive theorists have argued that we can be sensitive to our use of stereotypes and, whilst stereotypes may be activated automatically in social perception, they can be consciously controlled, and suppressed in decision-making. This presentation will argue that the cognitive approach has ignored the importance of culture in the construction and use of stereotypes. Through the framework of social representations theory it is proposed that stereotypes are not rigid overgeneralizations but cultural myths (and social representations) and are perpetuated through communication in culture. Stereotypes may owe more to culture than to cognition. Dr Perry Hinton has degrees in Mathematics from the University of Warwick and Psychology from Birkbeck College, University of London. Since receiving his doctorate in cognitive psychology from Oxford University, he has worked in four British universities, in positions ranging from lecturer to head of department, often in a multidisciplinary team. He has taught a wide range of psychological topics, but primarily in the area of social cognition, culture and media. His books include: The Psychology of Interpersonal Perception and Stereotypes, Cognition & Culture. He is the editor of the twenty volume Psychology Focus series published by Routledge. Currently he is researching into the cultural context of media interpretation, particularly the representation of Japanese popular culture in the Western media. Dr Barbara Clark, linguistic anthropologist, will be giving a talk on communication in aviation incidents and the impact of culture and context. When cabin and flight crew write reports of aviation incidents, they are doing a lot of communicative work outside reporting of facts. This work includes constructing (a) their identities within the assumptions they have about themselves, other crew and institutional authorities, and (b) the context of the incident in question. Only through unearthing these motivational and contextual factors and understanding the communicative techniques employed can we begin to understand what an inflight incident report is telling us about a particular event – and the context in which it is situated. In this talk, Barbara explores how to use techniques from linguistic anthropology to reveal the information that is buried within the text of incident reports. The fact that anything is being said, how things are said, and what is unsaid all give us clues to what actually occurred, but often other equally important facts are unconsciously masked by communicative performances. Dr Barbara Clark is a linguistic anthropologist, and founder of You Say Tomato, which provides communication consulting services. Dr Clark spent ten years in the commercial aviation industry, giving her a unique insight into inflight crew communication and interaction, and the importance of crew cohesion to aviation safety and security. Her PhD research (Queen Mary, University of London) investigated how cabin crew’s use of language impacted on intercrew cohesion with pilots. Currently Dr Clark is working with the UK Civil Aviation Authority researching communication between pilots and air traffic controllers. Dr YANG Xianju, visiting academic from Zhejiang Gongshang University, Hangzhou, China, will be giving a talk on her research "Investigating the pragmatic competence of Chinese learners of English." Dr CHEN Shen, visiting academic from the University of Newcastle, Australia, will be giving a talk entitled Promoting Intercultural Awareness of L2 Teacher Trainees Through In-country Experience. My talk aims to invite criticism and comments on a longitudinal investigation on in-country experience conducted at University of Newcastle, Australia. Three key questions will be raised and discussed in terms of how to promote intercultural awareness of L2 teacher trainees. (1) What is the place of intercultural awareness in the curriculum for L2 teacher training? (2) How should students be prepared for language teaching and learning in another cultural environment? (3) What are the learning outcomes of in-country experience? The discussion attempts to evaluate three existing strategies used for preparing in-country experience. Firstly, an “additive model” combines an element of “explicit cultural studies” with a L2 program. Secondly, an “integrative model” focuses on target language use in communication in a specific cultural environment. Thirdly, an “interactive model” is based on the intercultural interaction and the post-structuralist view of language education. It is also proposed a “three dimensional approach” of learning to know, learning to do and learning to interact. Discussion of the following article: Kimmel, K. and Volet, S. (2012) Understanding motivation, engagement and experiences of intercultural interactions at university: a person-in-multiple contexts perspective. European Journal of the Psychology of Education, 27, 227-245. Continuing our theme of motivation and intercultural interaction/competence, we'll be discussing the following article: Masgoret, A.-M. (2006) Examining the role of language attitudes and motivation on the sociocultural adjustment and the job performance of sojourners in Spain. International Journal of Intercultural Relations 30, 311-331. We'll also be giving feedback to Claudia and Helen on their pilot questionnaire. Ema Ushioda will be leading a discussion on the following article: Dunne, C. (2013) Exploring motivations for intercultural contact among hostcountry university students: An Irish case study. International Journal of Intercultural Relations, 37, 567– 578. This paper will discuss the direction of the most recent research by the Wellington Language in the Workplace Project team, which has involved analysing data from workplace sites where recently arrived refugees are likely to seek work. I focus in particular on the challenge of developing relevant sociopragmatic skills for use in such workplaces, illustrating from both the transactional (directives) and relational (small talk, humour) dimensions of workplace interaction. The worksites used for exemplification are unmistakably gendered as relatively more masculine, namely building sites, or relatively more feminine, namely eldercare residencies. Finally, the paper will provide some specific examples of how our research has been used in preparing people for real world workplace contexts. Viewing and discussion of a video-recorded conference presentation by the renowned psychologist, Geerte Hofstede. Talk by Keith Richards on "Using cognitive interviews in critical incident research". Viewing and discussion of a video-recorded conference presentation by the well-known cross-cultural psychologist, Peter Smith. Guest talk by Jenny Plaister-Ten of 10 Consulting. Doing Business across Cultures. Personal Experiences. Viewing and discussion of a video-recorded conference presentation by the well-known interculturalist, Fons Trompenaars. Discussion of UNESCO's recent report 'Intercultural Competences'. A collaborative workshop for staff from the engineering and applied linguistics departments at the Universities of Warwick, Tokyo and Leuven. The aim of the workshop was to explore areas of collaboration, both in research and materials development. The event was funded by the International Office, following a successful bid from CAL. Event organised in collaboration with Warwick International Office, UKCISA and Students' Union . For abstracts and presentations (pdf of powerpoints and video recordings) please see our Global People website. Claudia Harsch will give a presentation on her research into 'Intercultural competence for the workplace'. In this talk I consider research into ‘relating at work’. Recent theorising in pragmatics has drawn attention to the importance of analysing relations, and yet the pragmatic study of relations is almost exclusively focused on issues of (im)politeness, face and rapport. I start by briefly reviewing this research, and then report a study on ‘relating at work’ in which leaders and interns were interviewed about their experiences of starting work in a culturally unfamiliar setting. I identify the complex web of interrelated facets that they talk about and propose that Relational Dialectic Theory (RDT) can provide a useful theoretical framework for conceptualising relations. Finally, I argue that RDT can only offer a descriptive framework and that face/rapport management theory is needed for explanatory/motivational purposes. The two are thus complementary to each other and should not be conflated. Daniel Dauber will give a presentation on his OCT project (Organisational Coherence and Trajectory), which aims at exploring organizational dynamics by considering, in particular, cultural and intercultural aspects in a multidisciplinary context. Guest Lecture by Professor Mike Handford (University of Tokyo) - "Moving beyond description in professional discourse analysis: international construction industry interactions"
Candlin argues that the analysis of professional discourse should not stop at textual description and social interpretation, but needs to engage at an explanatory level with the community who have been researched (Candlin, 2006). In this talk I will discuss an interdisciplinary approach that aims to achieve these three aims (Handford, 2010). The data discussed is mainly from a large joint venture construction project in Hong Kong, which is managed by a Japanese company. Data includes audio and video recordings of the English interactions, interviews with the participants and researcher field notes. The talk will explore three interrelated areas related to the analysed on-site communication: a corpus-driven description of verbal and non verbal communication (Handford and Matous, 2011), a discussion of problem-solving from a cultural perspective, and a brief outline of critical incidents that can be used for awareness-raising among engineering students, engineers and decision-makers in the industry. This research is intended to add to the growing body of work into ‘construction communication’ (Dainty et al, 2006). Candlin, C. 2006. 'Accounting for interdiscursivity: challenges to professional expertise'. In M.Gotti & D.Giannone (Eds) New Trends in Specialized Discourse Analysis. Bern: Peter Lang Verlag. Dainty, A., Moore, D. and M. Murray. 2006. Communication in Construction: Theory and Practice. London: Taylor and Francis. Handford, M. 2010. The Language of Business Meetings. Cambridge: Cambridge University Press. Handford, M. and P. Matous. 2011. ‘Lexicogrammar in the international construction industry: A corpus-based case study of Japanese-Hong-Kongese on-site interactions in English'. English for Specific Purposes, 30/2: 87-100. Michael Handford, PhD (Nottingham) is professor in international education at the University of Tokyo, where he teaches and lectures on intercultural communication, discourse analysis, lecturing skills, and professional communication. He is the author of The Language of Business Meetings (Cambridge University Press, 2010), and co-editor, with James Paul Gee, of The Routledge Handbook of Discourse Analysis (2011). He has also published journal articles and book chapters on metaphor and conflict in business meetings, genre, corpus linguistics, sociopragmatics and language learning, and international professional communication. He is winner of the 2011 Horowitz Prize for best ESP journal article. He also works as a communication consultant with several Japanese multinationals, and is co-author of the Cambridge University Press business course book series, Business Advantage: Theory, Practice, Skills. By definition international, highly complex technologically and operationally, the upstream oil and gas business provides a fascinating crucible of inter-cultural issues of all kinds. Working through the prism of the inter-relationship between national, organisational and technical cultural tensions, where risks are potentially huge and uncertainties often ungoverned, it’s an industry that tests the competency of international managers to the limit. Large-scale societal changes and challenges can have a substantial impact on our personal relationships. Some changes – such as modernization - may be relatively gradual, with shifts in values eventually influencing relationship choices. Other, more rapid social changes may directly influence relationship behaviours; these, in turn, can help promote new relationship values and ways of interacting. Rapid challenges to a society – such as new pandemics - may amplify existing relationship dynamics, bringing together partners and families, whilst exacerbating existing out-group hostilities. In this talk I discuss previous research on modernization, cultural adaptation and close relationships alongside some of my own recent work on terrorism, pandemics, earthquakes, and their relationship consequences. 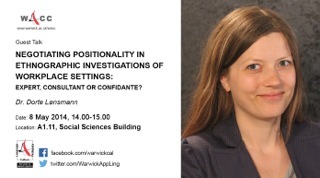 Dr Marian van Bakel will lead a discussion of her draft proposal for a postdoctoral Rubicon scholarship "Contact with locals: the benefits of bridging the gap." This talk reports on a case study of 12 Korean and Chinese (PRC) mothers in the Republic of Singapore and focuses on the intersections between religious affiliations, gender roles, and linguistic processes in globalized economies. Two key research questions are: What are the sociolinguistic circumstances underlying the buying and selling of linguistic capital and how is the English language involved in these transactions? What roles do church and temple affiliations play in the lives of such transnational mothers and their linguistic aspirations for their children? Over the last few decades, New Zealanders have increasingly begun to perceive their country as a relatively diverse and multicultural society. People migrating to New Zealand often find, however, that their experience does not always live up to this rhetoric. Drawing on a theoretical model developed to analyse workplace discourse in its wider socio-cultural context (Holmes, Marra and Vine 2011), this paper examines research evidence of the attitudes of New Zealanders towards skilled migrants as they enter the professional New Zealand workforce. Data from interactions between migrants and their workplace mentors is used to analyse these attitude, with some encouragingly positive results. The recorded data used in the analysis was collected by migrants enrolled in a communication skills course with an internship component which provided them with experience in New Zealand workplaces. These new citizens are people with tertiary qualifications, relevant workplace experience, and a high level of proficiency in English. Their experiences provide useful insights into the accommodations required by all parties in the process of joining a new community of workplace practice. The paper concludes with some reflections on ways in which applied linguists can work with members of the wider workplace community to identify and research areas of mutual concern, presenting research which is paradigmatically “applied linguistics applied” (Roberts 2003). Discussion of the following journal article: van Bakel, M., Gerritsen, M. and van Oudenhoven, J.P. (2011) Impact of a local host on the success of an international assignment. Thunderbird International Business Review 53(3): 391-402). Dr Celia Thompson of the University of Melbourne will give a talk entitled "Rediscovering myself: A dialogic approach to the design of a transcultural communication classroom activity for multilingual learners." Abstract. Warwick Integration Summit 2012. "Measuring integration and the internationalised student experience". Organised by the International Office and the Warwick Student Union, with the support of the WACC group in the Centre for Applied Linguistics. Discussion of the following journal article and reflection on implications for "Cultural Integration". Leask, B. & Carroll, J. (2011) Moving beyond 'wishing and hoping': internationalisation and student experiences of inclusion and engagement. Higher Education Research and Development 30(5): 647-659. Andy Davidson will talk about his PhD research on the intercultural integration of East Asian PhD students. Please click here for further information, and his draft data collection instruction, an interaction log. Discussion of the following journal article and reflection on the question "What does 'cultural integration' mean for a university campus?" Boski, P. (2008) Five meanings of integration in acculturation research. International Journal of Intercultural Relations 32: 142-153. "The Influence of Cultural Diversity on Learning Interactions: A Longitudinal Study of Rapport Management in an Undergraduate Problem Based Learning Group." She will be drawing particular attention to the impact of face on the functioning of PBL in a group that was diverse especially in age. Summary paper and pdf of ppt. Professor Jean-Marc DeWaele, Birkbeck College, University of London, gave a talk on: Emotions in applied linguistic research and foreign language teaching. In this lecture I will present an overview of the recent surge of interest in the field of emotion and multilingualism. I will show how cognitive psychologists, anthropologists and applied linguists collaborate using a combination of different research methodologies in order to answer common research questions. I will look at emotion words and expressions (swearwords, anger, declarations of love), which are generally perceived to be more emotional in multilinguals’ first language. However, in some cases it is the foreign language that becomes more emotional. I will also consider the effect of foreign language instruction on the communication of emotion and on affective variables in the foreign language. Dewaele, J.-M. (2008) The emotional weight of ‘I love you’ in multilinguals’ languages. Journal of Pragmatics, 40, 1753–1780. - - - (2008) Appropriateness in foreign language acquisition and use: Some theoretical, methodological and ethical considerations. International Review of Applied Linguistics, 46, 235–255. - - - (2010) Emotions in Multiple Languages. Basingstoke: Palgrave Macmillan. - - - (2011) The differences in self-reported use and perception of the L1 and L2 of maximally proficient bi- and multilinguals: A quantitative and qualitative investigation. International Journal of the Sociology of Language, 208, 25-51. - - - (2011) Reflections on the emotional and psychological aspects of foreign language learning and use. Anglistik, 22, 23-42. Thursday 17 November (S2.85) 15.30 - 17.00. Daniel Dauber gave a talk on the following: "Collecting data via interviews in intercultural studies: Challenges, strategies, and 'moderating' factors". It will relate to his recent/current experiences of interviewing outward mobility students who took part in work placements overseas and have now returned to Warwick. Thursday 10 November (S0.19) 14.00 - 15.00. Steve Clarke of Thare Machi Education gave a talk on "Saving Lives through Education". Thursday 3 November (S2.85) 15.30 - 17.00. Sophie Reissner-Roubicek led a discussion on issues emerging from the event Intercultural Communication: From Theory to Practice and Back that was held at the University of the West of England, Bristol, on Saturday 29 October 2011, and which many of our MSc students attended. Thursday 20 October (S2.85) 15.30 - 17.00. Wang Jiayi gave a talk about her recent experiences of collecting critical incident data. Tuesday 27 September (S2.85) 16.00 - 17.30. Discussion session on "Collecting critical incident data for research purposes". There are two papers: a compilation paper, including plans for a forthcoming project; an extract from Cushner and Landis 1996. Tuesday 31 May (S0.18) 14.00 - 15.30. Special guest talk by Professor Janet Holmes, Honorary Professor at CAL. Constructing Leadership Identities in Intercultural Workplace Contexts. Thursday 2 June (Cowling Room) 10.00 - 12.00. Workshop by Professor Janet Holmes. Workplace Discourse: methods, analysis, applications. Wednesday 11 May (S0.18) 14.00 - 15.30. Special guest talk by business entrepreneur, Ram Gidoomal CBE. Sustaining Dialogue: Multicultural Societies under Pressure. In exploring this controversial topic, Ram will draw on his extensive experience as a successful business entrepreneur who has worked effectively across numerous different boundaries (e.g. ethnic, national, religious). Ram's talk forms part of the Faculty of Social Science's festival, and helps launch our new masters degree MSc Intercultural Communication for Business and the Professions. Ram Gidoomal CBE came to Britain from East Africa as a refugee in 1967. He is an entrepreneur and former United Kingdom Group chief executive of the Inlaks Group, a multinational business with seven thousand employees. He is actively involved in a very large number of enterprises, organisations and charities, too many to include here; but to mention some of the most relevant to this occasion, he is Chairman of the South Asian Development Partnership, author of Sari 'n' Chips, The British and How to Deal with Them: Doing Business with Britain's Ethnic Communities, and Honorary Member, Faculty of Divinity, Cambridge University. He was candidate for Mayor of London in 2000, as Leader of the Christian Peoples Alliance, gaining 100,000 votes. Discussion of the following book chapter: Webster, L. and Mertova, P. (2007) Using Narrative Inquiry as a Research Method: An Introduction to Using Critical Event Narrative Analysis in Resarch on Learning and Teaching. Chapter 5: A critical events approach to narrative. Abingdon: Routledge. Tuesday 1 March (A0.05) 14.00 - 15.30. Talk by Mary Vigier on her PhD research. "Building Global Teams: The Interplay of Language and Trust." Mary Vigier. This talk presents findings that are emerging from a qualitative study of international teams within a multinational company headquartered in France. The presentation will begin with a brief overview of the research focus and of the two main methods of data collection: (1) non-participant observations of intercultural team interactions; (2) in-depth interviews conducted with over forty international managers, from more than a dozen countries, who were involved in these interactions. In the second part of this talk, the presenter will share some preliminary findings from her analysis of the data that stand out as crucial components in the corporate teambuilding process. Insights from her research to date underline the impact of a context of trust on language behavior and communication processes. In today’s global workplace, the level of trust contributes to enhancing meaningful communication and working towards achieving common goals. Where confidence is lacking, there is a greater likelihood of misunderstandings and conflict. Mary Vigier is Chair of the Intercultural Communication Department and a Professor of Business English at ESC Clermont School of Management in Clermont-Ferrand, France. She has been a part-time post-graduate research student at the Centre for Applied Linguistics, University of Warwick, since September 2008. Her research focuses on becoming a team player in an MNC. Tuesday 22 February (A1.07) 13.30 - 15.00. Exploration of pragmatic research using 'critical incidents'. Discussion of the following paper: Culpeper, J., Marti, L., Mei, M., Nevala, M. and Schauer, G. (2010) Cross-cultural variation in the perception of impoliteness: A study of impoliteness events reported by students in England, China, Finland, Germany and Turkey. Intercultural Pragmatics 7(4): 597-624. Monday 7 February (S2.85) 13.30 - 15.00. Continuation of our exploration of 'Critical incidents' as a research technique. Discussion of the following paper: Chell, E. (2004) Critical incident technique. In: Cassell, C. and Symons, G. (eds) Essential Guide to Qualitative Methods in Organizational Research. (pp.45-60) London: Sage. Monday 24 January (S2.85) 13.30 - 15.00. Discussion of the following paper: McAllister, L. et al. (2006) Reflection in intercultural learning: examining the international experience through a critical incident approach. Reflective Practice 7(3): 367-381. Monday 29th November (A1.05) 15.00 - 16.30. Discussion of the following paper: Kinginer, C. (2004) Alice doesn't live here anymore: Foreign language learning and identity reconstruction. In: A. Pavlenko and A. Blackledge (eds.) Negotiation of Identities in Multilingual Contexts. Clevedon: Multilingual Matters, pp. 219-242. Thursday 18th November (A1.05) 16.00 - 17.30. Monday 15th November (A1.05) 15.00 - 16.30. Workshop to continue examining the data collected by the International Office on students' feedback on their mobility (inward and outward) experiences. Focus: key themes emerging from the comments. Monday 1st November (A1.05) 15.00 - 16.30. Workshop to examine the data collected by the International Office on students' feedback on their mobility (inward and outward) experiences, and to consider/plan best ways of analysing it. Monday 18th October (A1.07) 15.00 - 16.30. Discussion of the following two papers: Dunne, C. (2009) Host students' perspectives of intercultural contact in an Irish university. Journal of Studies in International Education 13: 222-239. Ujitani E. and Volet, S. (2008) Socio-emotional challenges in international education: insight into reciprocal understanding and intercultural relational development. Journal of Research in International Education 7: 279-303. Tuesday 21st September in B0.41/43 14.00 - 15.30. Talk by Mary Vigier on her PhD research: "Becoming a Team Player in a Multinational Corporation. Preliminary Findings from a Pilot Study." Follow-up talk/workshop by Miguel Garcia-Yeste: "Analyzing the communicative styles of press advertisements from a cross-cultural perspective." Miguel is a visiting research student from the University of Alicante, Spain. Talk / workshop by Miguel Garcia-Yeste: "Analyzing the communicative styles of press advertisements from a cross-cultural perspective." Monday 28 June in A1.06 14:00 - 15:00. Talk by Stephanie Schnurr: "Intercultural leadership: A discourse analytic study of language and communication in multicultural workplaces in Hong Kong." Thursday 29 April in MS.03 (2nd floor of Mathematics and Statistics) 14:00-15:30 hours. Talk by Dr. Francesca Bargiela: "Business discourse across cultures: data selection, collection and analysis." Thursday 18 March in S2.85 16:00-17:00 hours. Talk by Hanne Tange: "Dressing up for international teaching - roles and expectations in Danish higher education." Wednesday 3 March in S1.71 14:00 - 15:00 hours. Discussion of the following paper: Spreckels, J. and H., Kotthoff (2007) 'Communicating Identity in Intercultural Communication.' in Kotthoff, H. and H., Spencer-Oatey (eds.) Handbook of Intercultural Communication. Berlin: Mouton de Gruyter. Tuesday 16 February in S1.71 16:00 - 17:00 hours. Talk by Mikio Iguchi: "A qualitative study of adaptation, identity, and motivation among Japanese in the British context." Wednesday 03 February in S0.17 13:00 - 14:00 14.00 - 15.00 hours. Talk by Ana Beaven: "Erasmus Student Mobility: Researching Students' Adaptation and Sense of Identity"
Tuesday 26 January in S1.71 16.00 - 17.00 hours. Discussion of the following paper: Ting-Toomey, Stella (2005). 'Identity Negotiation Theory: Crossing Cultural Boundaries'. In: William Gudykunst (ed), Theorizing about Intercultural Communication. Thousand Oaks: Sage. 211-233. Tuesday 24 November in A0.14 16.00 - 17.00 hours. Discussion of the following paper: Stubbe, M. and J. Holmes (2000) 'Talking Maori or Pakeha in English: Signalling Identity in Discourse'. in Bell, A. and K. Kuiper (eds.). New Zealand English. Amsterdam: John Benjamins. Tuesday 17 November in A0.14 16.00 - 17.00 hours. Discussion of the following working paper: Spencer-Oatey, H. (2009) Conceptualising Identity: Social Psychological Perspectives - Working Paper. Tuesday 3 November in A0.14 16.00 - 17.00 hours. Discussion of the following paper: Kim, Y.Y. (2007) Ideology, identity and intercultural communication: an analysis of differing academic conceptions of cultural identity. Journal of Intercultural Communication Research 36 (3): 237-253. Tuesday 20 October in A0.14 16.00 - 17.00 hours. Discussion of the following paper: Fougère, M. (2008) Adaptation and identity. In: H. Spencer-Oatey (ed.) Culturally Speaking. Culture, Communication and Politeness Theory. London: Continuum, pp.187–203. Thursday 28 May in S2.85 13.30 - 15.00 hours. Discussion of the following forthcoming paper: Marra, M., Holmes, J. and Riddiford, N. New Zealand's Language in the Workplace Project. Workplace Communication for Skilled Migrants. Thursday 30 April in S2.8513.30 - 15.00 hours. Talk by Torri Wang (Open University) on her PhD research on humour in English academic lectures. Thursday 5th March in S2.85 13.30 - 15.00 hours. Discussion of the following papers: Gu, Q., Schweisfurth, M. and Day, C. (n.d.) Learning and personal growth in a 'foreign' context: Intercultural experiences of international students. And Day, C., Sammons, P. and Gu, Q. (2008). Combining qualitative and quantative methodologies in research on teachers' lives, work, and effectiveness: From integration to synergy. Educational Researcher 37: 6, 330-342. Wednesday 18th February in S0.20. 14.00 - 15.30 hours. Professor Chris Day and Dr Qing Gu from the University of Nottingham will be speaking on their ESRC funded research project into the experiences of international students at British universities. This is an open session for any staff, research students and MA students across the university who are interested in attending. Wednesday 11th February in S0.11. 15.30 - 17.00 hours. Dr Jo Angouri from the University of the West of England will be speaking on the cultural/intercultural content of Business English textbooks. This is an open session for all staff, research students and MA students. Thursday 22nd January in S2.85 13.30 - 15.00 hours. Discussion of the following papers: De Nooy, J. and Hanna, B.E. (2003) Cultural information gathering by Australian students in France. Language and Intercultural Communication 3(1): 64-80. & Greenholtz, J. (2003) Socratic teachers and Confucian learners: examining the benefits and pitfalls of a year abroad. Language and Intercultural Communication. 3(2): 122-130. Discussion paper: Shapiro, J.M, Ozanne, J.L. and Saatcioglu, B. 2008. An interpretive examination of the development of cultural sensitivity in international business. Journal of International Business Studies 39, 71-87. Talk: Dr Helen Spencer-Oatey and Dr Stefanie Stadler "Intercultural communication competences at work: Using data from Sino-UK project meetings to conceptualise a framework"
Guest talk: Dr Hale Isik-Guler "(Im)politeness research methodology: What can second-hand data offer?" Discussion papers: Jackson, Jane. 2008. Globalization, internationalization, and short-term stays abroad. International Journal of Intercultural Relations 32, 349-358. & Spencer-Oatey, H. and Xiong, Zhaoning. 2006. Chinese students' psychological and sociocultural adjustments to Britain: An empirical study. Language, Culture and Curriculum 19: 1, 37-53. Francis, June N.P. 1991. When in Rome? The effects of cultural adaptation on intercultural business negotiations. Journal of International Business Studies 22 (3): 403-428. Lee, Theresa Man Ling (2005) Intercultural teaching in higher education. Intercultural Education 16 (3): 201–215. Main Theme: What is intercultural effectiveness? Discussion paper: Belz, J. and Muller-Harmann, A. (2003) Teachers as intercultural learners: negotiating German-American telecollaboration along the institutional fault line. The Modern Language Journal 87 (1): 71-89. Discussion paper: Draft chapter on Intercultural Competence from Spencer-Oatey and Franklin (forthcoming) Intercultural Interaction: A Multidisciplinary Approach to Intercultural Communication. Basingstoke: Palgrave Macmillan.